So, my exile server that only has DMS and exile is running at really high CPU usages pretty much all the time and server FPS drops quickly after 20 players are in the server. Is this common or is there something wrong with my setup? This seems odd to me but my player count is low in comparison. 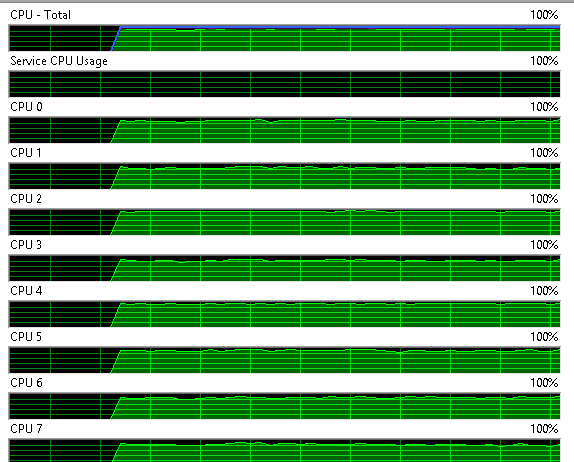 I run my server on a quad core i5 with 8GB RAM and a local mySQL DB. I have DMS, Occupation and ExileZ2 running on it and it typically sits around 30% cpu load with a few players online (Bloody Zed ). It does spike to about 50 - 70% when DMS missions are spawning in however just for a few seconds and FPS typically stays above 20 during these "high load" periods so doesn't impact players. Honestly, I'll have to check on next restart but I believe it's jumping up to that load at around like literally 10 minutes into server launch. I understand players would raise it, but I doubt it would be this quick. Do my startup params look fine? That's the only thing I could think could be the issue? Edit: 46 people on, server fps 10 and dropping. 1 hour untill restart on a 4 hour cycle. 1. Is this a hosted, Virtualised server or Dedicated? If virtualised then maybe the host it's running on is overcontended. 2. What processes on the machine are actually chewing up all that CPU time? Is it ARMA? Is it SQL? Something else? 3. Last thing to check for is Overheating - if the CPU overheats it'll throttle back to prevent thermal runaway which of course will make the server run like a pig. Sorry we aren't getting you a quick answer but I hope this troubleshooting is helping. I'll give this a shot for next restart and edit this and let you know how it goes. This is a rented dedicated, I was originally running on a 16 core VPS but I figured a dedicated would yield better performance but it's not at the moment. The only process that's taking up all that CPU is arma, I don't really understand why. And no problem at all about not getting a quick answer, I tried everything I could think of yesterday on several restarts and am just looking for any input and help the community can provide. Edit: A little update, 36 players on 3 hours into the restart and the server fps is 15 and dropping. A little bit of an update: So, I've tried the startup params that 1man has posted up there and this has reduced CPU load by 50% but the server FPS seems to be dropping quicker. So, I'm wondering if it's because of the -enableHT, or the -exThreads that increased the load. I'll do some more testing for next restart but I'm on 4 hour restarts so that's slightly delayed for me as I don't want to cause any interruption of play for my users. So, one thing I don't understand about this is that your -exThreads is set to 0. Doesn't this disable exthreads or am I thinking of this in the wrong way? Edit: Yeah, with these settings you put when my servers at 50+ players as it is right now the server fps drops down to less than 5.